Well, today we traveled to Demopolis, Alabama, to visit with my mom's cousin from Florida (and her family) and my grandfather's sister (i.e. my great aunt). We had a really nice time and it was wonderful to see everyone. Though I see my great aunt occasionally, I haven't seen my cousins from Florida in years. After coming home, I took a really long nap (didn't sleep at all last night). After, I made cookies (dough was a bit dry...so much for the Good Housekeeping "we tested it three times" assurance). Anyway, I fixed it up and it turned out fine! My dad is such a cookie monster, so he would eat them even if they tasted terrible (which, thankfully, they didn't!). Like I said in a previous post, I just couldn't figure out what I wanted to read next. So, Monday night, before I took my father (he can't drive anymore) to play in the band at Shelton for graduation, I stopped by Books-a-Million and found another interesting book for a dollar. 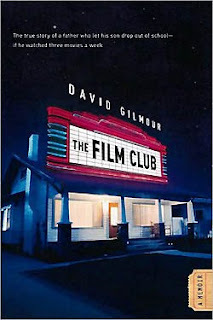 This one is a memoir by David Gilmour called The Film Club (note: also at a bargain price on Amazon). The book follows the author from the point that his teen son decides to drop out of high school until the point when the son (as an adult) decides to go to college. The father, when the son tells him he wants to drop out of high school, tells his son that he can do so (and stay at home rent free and not have to work) as long as the kid agrees to watch three movies with his father a week. Yes. It sounds absolutely nuts. But the story is fascinating. Now, that being said, the memoir has flaws. The transformation of the boy is not a strong point of the book. The coverage of the films is excellent as are the conversations between the father and son about the movies and other matters. Still, I don't see the boy changing as much as I think that Gilmour wants us to imagine. (This book is very short, by the way, but is also VERY readable.) When Jesse (the son) finally decides to get a GED equivalent, the moment just doesn't ring true because we haven't been adequately prepared for it. Still, it is fascinating to hear about some of the movies they watched and why (as that was the only education the father felt he could give his son without Jesse feeling like it was an education). I also thought that the background stories were really interesting (between Gilmour and his wife and ex-wife; between Jesse and a girl that haunts him; Jesse's interest in becoming a rap star; etc.). Still, even though I didn't feel ready for the ending, I really enjoyed reading the book because the narration is strong and keeps the reader engaged. Gilmour also doesn't cover up his son's weaknesses, yet you can tell that he is absolutely in love with his son in a way that only a parent can be. My primary reason for picking up the book was the emphasis on film and curiosity about which films Gilmour would choose to show his son. I picked up some great ideas about movies to watch! But, I was pleasantly surprised by how much I enjoyed Gilmour's writing style and ability to weave all kinds of stories together without the reader feeling overwhelmed or frustrated. I felt like I knew everyone when I finished the memoir...and that is saying something...because, usually, at least in my memoir reading experience, I often don't wonder about every single person I encounter in the book. I might latch on to a few, but that is about it. So, no--not the best memoir in the world...but it is interesting and different from most I have read! Enjoy!